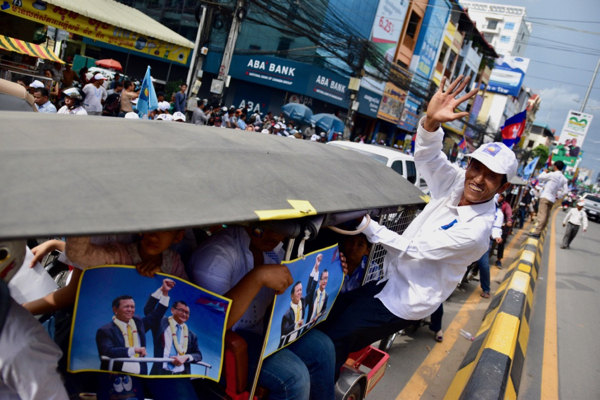 PHNOM PENH — Preliminary results in Cambodia’s June 4 local, or commune, elections indicate a narrow win for Prime Minister Hun Sen’s Cambodian People’s Party. The CPP took 51% of the popular vote, giving it control of around 1,100 of the country’s 1,646 communes. But nearly half of all voters opted for the opposition Cambodian National Rescue Party, suggesting a close fight in next year’s parliamentary elections. The local elections were a dry run for the 2018 poll. Two days before the vote, Hun Sen led a huge CPP rally in Phnom Penh — a rare appearance from a leader previously so confident that he rarely campaigned. The CNRP emulated the CPP later the same day. Tens of thousands of both parties’ supporters rode around the capital in festive convoys of trucks and motorbikes around 5km long. In the last commune elections in 2012, the CPP won over 60% of the vote. But that landslide prompted two opposition parties to form the CNRP, which a year later almost won the national poll. So close did the CNRP come in 2013 that it accused the government of cheating. The party boycotted parliament, triggering months of protests. INTIMIDATION AND GROWTH But while the voting itself may have been clean, the campaign was fraught. Hun Sen threatened “civil war” if the CPP loses power in 2018, while former opposition leader Sam Rainsy remains in self-imposed exile in Paris avoiding defamation charges he says are politically motivated. Hun Sen is adamant that his party will retain control beyond 2018. “It will definitely go to the children and grandchildren of the CPP, not others,” he told supporters on June 2. The concern is that the government could step up its bullying if it fears losing in 2018. Hun Sen has held power through patronage, bribery, threats and violence — supplementing his record of overseeing two decades of economic growth of over 7% a year. Even though Cambodia’s $19.39 billion economy is only a tenth that of neighboring Vietnam, it is an important hub for garment and footwear makers exporting to the West. Investors will be watching for unrest ahead of the 2018 election. But some investments have handed the CNRP a rallying call. Thousands of poor farmers have seen their land taken by big businesses, sometimes without consultation or compensation. Voter Ousa Visan said she believed the country’s development has been unequal. “The powerful steal the land,” she said. Hun Sen’s longevity in office could work against him, despite his success in attracting Chinese funding for ports and roads and pulling in Western garment factory investments. The prime minister has said these could be threatened by an opposition win. The prime minster’s methods may backfire. Despite CPP scaremongering ahead of the June 4 vote, turnout was a high 89%, and the strong opposition showing suggests Cambodians will not be cowed into sticking with the status quo next year. “I don’t think it has any impact on the people. I haven’t met anyone who says they are scared,” said Neang Sovathana, a prominent radio talk show host better known as DJ Nana. Some think fears of conflict are overblown. Khem Veasna, leader of the League for Democracy Party, one of 10 smaller parties that ran against the CPP and CNRP, believes that the big two will strike a deal if the 2018 elections do not produce a clear winner. “The CPP and CNRP will come together,” Veasna said, when asked if his party would consider a coalition with either party in the event of a hung parliament.